At the beach! 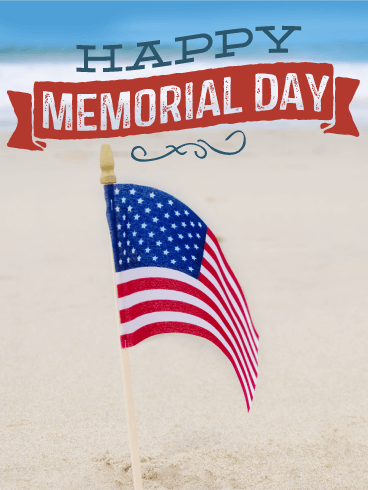 This adorable Memorial Day card features a sweet little American flag buried in the sand with the ocean gently out of focus behind it. 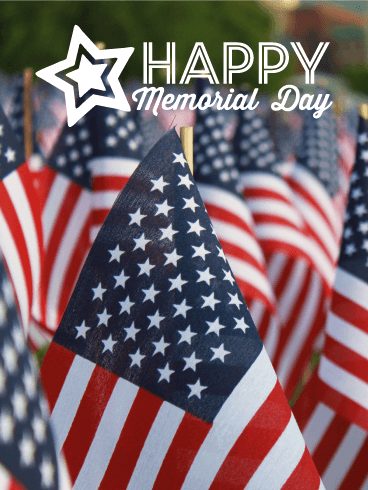 Whether you're spending your own Memorial Day at home with family, or barbecuing at the park with friends, you won't regret taking a moment to share this Happy Memorial Day card with someone special! Whoa! Shine on! Send up a scintillating spark on this Memorial Day weekend! Choose this electrifying Happy Memorial Day card to pass the celebratory spirit on to any important starry-eyed individual in your life! 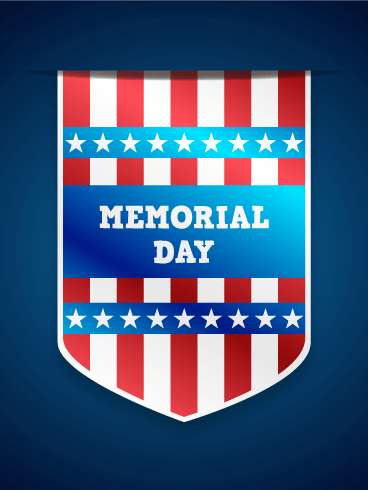 The bold Happy Memorial Day text shines as bright as your favorite fireworks display lighting up the night sky background in an American flag style pattern. Its got the stars! Its got the stripes! Its got the Happy Memorial Day wish bursting from its center! No doubt this card has it all, it just needs you to send it to your friends! Say it loud and proud this Memorial Day by sending this brilliantly red, white, and blue card to everyone you know and get this day of remembrance kicked off right! 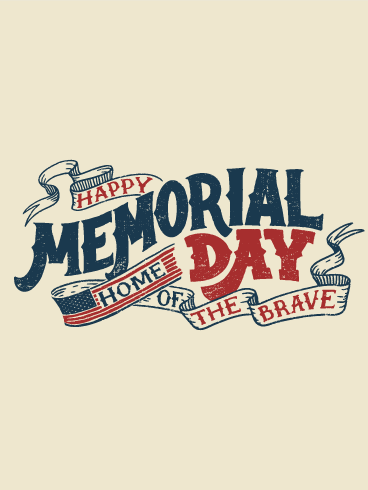 Remember and Honor, the central themes of Memorial Day festoon the front of this card on their own banner. 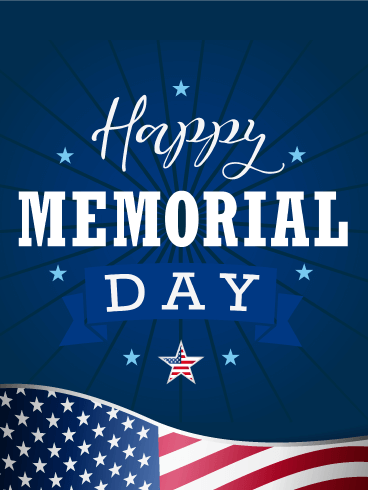 By sending this Happy Memorial Day card you are doing your part of remembering and honoring the country's fallen soldiers. Bordered by bright red, white and blue stars and stripes details this card passionately honors those that are no longer with us. Simple. Classic. American. 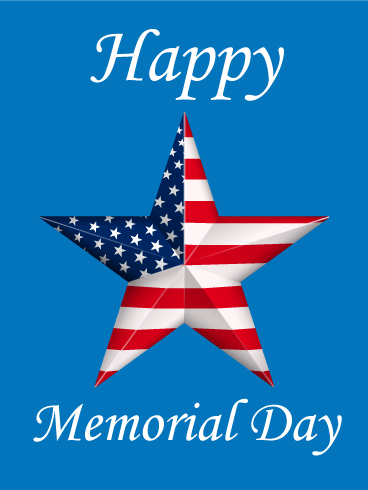 This Happy Memorial Day card features a large, five-pointed star printed to look like the American flag over a bright blue background. This bold star card is sure to inspire strong thoughts of the true stars of Memorial Day- the ones who fell while serving the country they so loved. 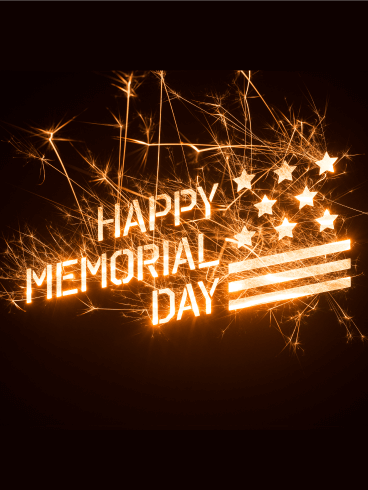 Keep their memories burning bright by sending this Memorial Day card to someone special. It's that time of year again to proudly wave your American flags and join in the parades with your loved ones! Memorial Day is here, a time for reverent remembrance of our fallen heroes, send this card to get the celebrations started. 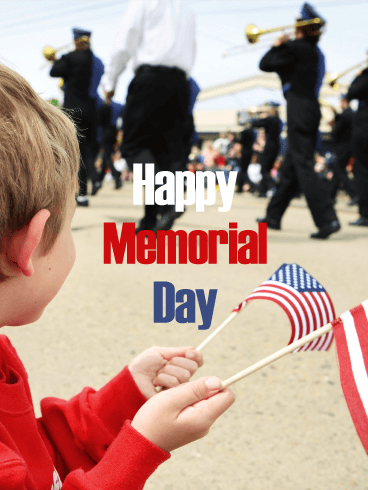 This Happy Memorial Day card uses a photo background of an actual parade, with a cute kiddo in the foreground excitedly holding up mini American flags. For this Memorial Day why not send someone a classy card done in vintage reds, whites, and blues. 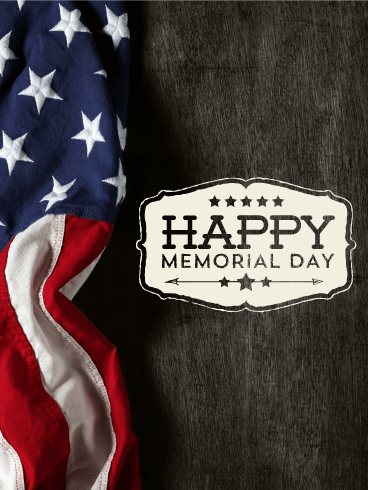 The bold text and ribbon banner lend this Happy Memorial Day card a truly classic Americana vibe, as American as apple pie and baseball really! The card also is decorated with the American flag and the patriotic phrase "Home of the Brave". Commemorate the veterans who gave their lives defending the land we love. Send this patriotic Memorial Day card. The homespun stars above the hand-stitched banner are full of warm Americana style. The United States is silhouetted beneath the blue rays of sunshine and stars. 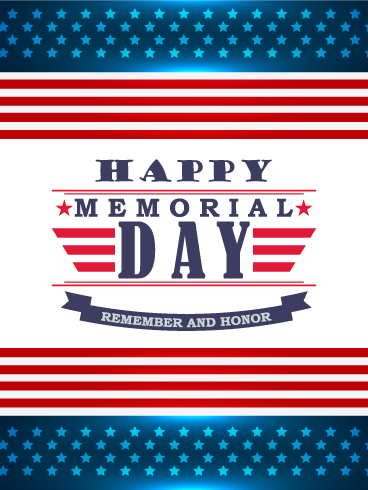 Whether you send it to someone who is in or was in the military, or to family and friends who are thankful for veterans, today is a great day to send a Memorial Day greeting card. Classic, patriotic, stunning. This Memorial Day card will make people proud to be American. It honors the lives of our veterans and is a reminder to all to give a moment of silence to those who lost their lives defending our freedom. 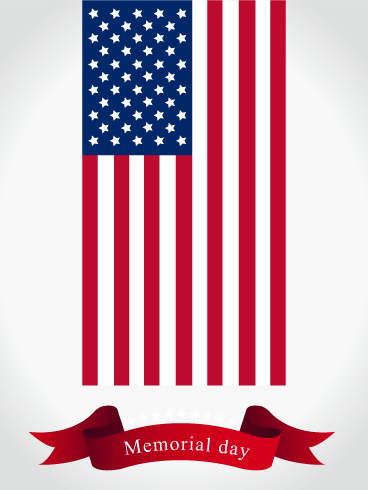 The stars and stripes inspire patriotism and pride. 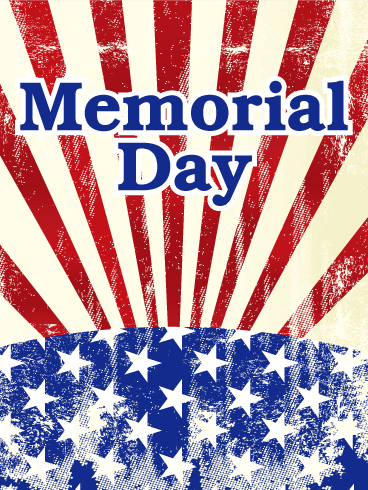 Why not send this gorgeous Memorial Day greeting card to celebrate this humbling and beautiful national holiday? The sun rises in the Red, White, and Blue of the United States' flag. It's a great day to be an American, and it's a great day to honor the lives of all the men and women who lost their lives defending our freedoms. Give a Memorial Day greeting and send this card to the people you love and cherish. 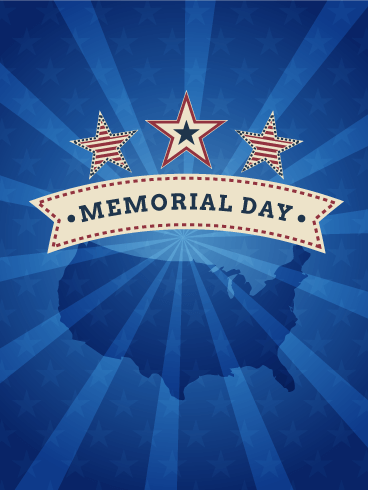 On Memorial Day, hearts are stirred, eyes are moist, and people come together in remembrance, peace, and thanksgiving. Old Glory shines brightly on this Memorial Day card. Sometimes you don't need words, just a symbol. The flag is a symbol of freedom, pride, and a national heritage. 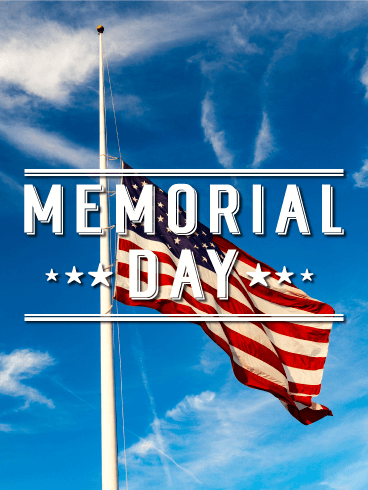 On Memorial Day, it's important to recognize and remember the fallen men and women who gave their lives in the name of freedom. Send this stunning Memorial Day card to everyone you know on this important holiday.